Gold is rightly considered one of the safest choices for investors. 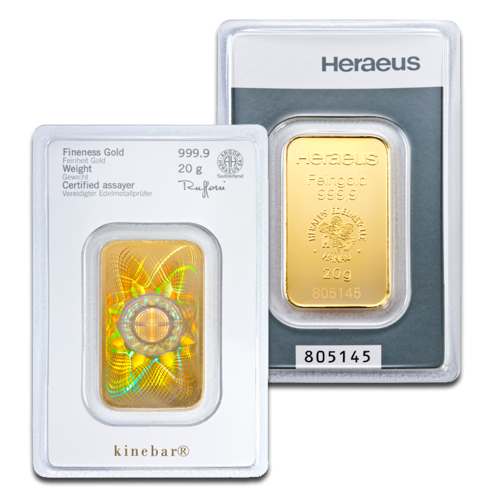 Over the centuries, man has never lost his love of this beautiful precious metal and leading refiners like Heraeus continue to find new ways to present it. The 20 g Kinebar from this leading German producer features the latest Kinegram technology on its reverse. Buy gold bars with CoinInvest.com and enjoy the timeless beauty of 20 grams of .9999 pure 24 carat gold combined with the latest security features. The Kinegram is an added security feature that enhances the value of each 20 g Heraeus Kinebar. It looks attractive and is a detail that is very much in demand among established and newer collectors and investors. The 20 g gold bar is substantial enough to noticeably increase the value of your portfolio yet it is still an affordable choice. When you buy gold with CoinInvest.com you can rely on finding the most popular products, like the 20 g Heraeus Kinebar, at remarkably low prices. That's because we buy in bulk in order to pass savings on to you. All orders are shipped quickly and discreetly so that you can appreciate the beauty of your 20 g Kinebars almost immediately. My preferred item. Very good price if I compare with price per oz and the hologram security it will be an extra argument when I want to resale.